I am 27 and I have always been a girly girl. Not all princess and designer handbag girly, but the kind of girly that made me fall in love with the sequin trend for this winter. Every time I saw a pair of sequin shoes, a dress, or accessories I would just stand and stare at it, wishing I had a reason to buy it. One day I said screw it and bought the most glittery dress you've ever seen. Then I bought the most glittery SHOES you've ever seen. And I decided I must throw a party. 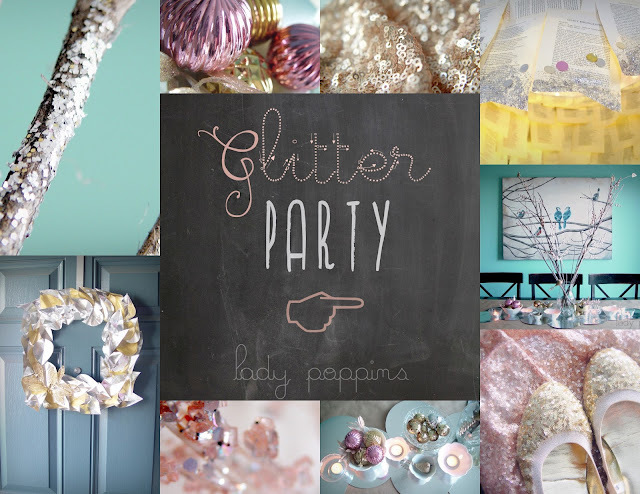 I started a Pinterest board with all the most beautiful inspiration and set up a Facebook Event telling all my girlfriends to watch for clearanced sequin items. I was delighted to find out that everyone was just as excited as me! I will take you on a tour of my decor (sadly taken the day after because I was in too much of a rush to take pictures before....and I am missing one piece of decor that was quite lovely, but my friend insisted she was taking it with her that night). We had a nacho bar for the party, so I bought packs of tins for us to broil them in. They came with the shiny tops so you could use it for leftovers. I threw them on the table and voila!! This one took a couple hours to make and I'm still not sure how I feel about it. I think I expected it to be breathtaking and it didn't live up to my imagination. To add extra sparkle I mixed mod podge with glitter and painted it on the bottom pages. I then glued sequins on top. 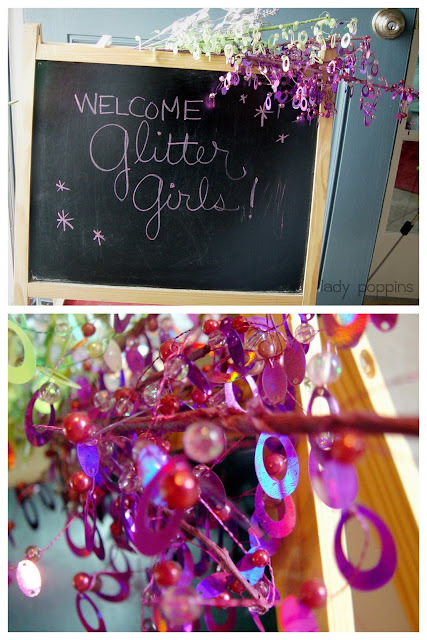 I made the "Glitter" banner using craft paper, mod podge and glitter mixture, and sewing thread. 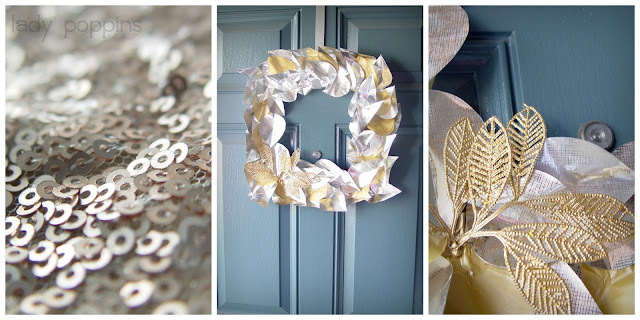 I hung up branches in various places and tied sparkly leaves from the Christmas clearance at Michael's. Everyone loved those little displays. I love it so much I think I'm going to keep it up. I made this photo backdrop using 3 rolls of kraft paper from the Dollar Tree....so it only cost me $3. I made the top have a seam so I could hang it on the curtain rod in my living room. It held up well and looked pretty in the pictures. I took pictures of the process, so I will have to make a tutorial later. This was honestly the BEST girl party ever. All of us late twenty year old girls had a blast! We danced to a Brittney Pandora station, drank wine and mixed drinks, played games (even Truth or Dare! ), and took almost a hundred silly photos in front of the photo backdrop. I think every girl should have a Glitter Party, no matter how old you are! This is so cute. I love all of the details!